Abiogenesis performed at the third edition of the Guwahati International Music Festival, a premier festival of world music and Northeast Indian Art and Culture in Guwahati on Feb. 8. 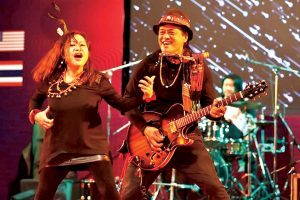 An update informed that the folk fusion band from Nagaland played three of their songs with Arenla on Vocals and Bamhum, Meren Tzudir on Bass, Neil Gonmei on Drums and Moa on Guitar, Bamhum and Harmonica. Organised by the Eastern Beats Music Society in collaboration with North Eastern Council, Government of India, the Guwahati International Music Festival is said to have included various workshops, lecture-demonstrations and a film screening during the day and performance by 150 artists from 4 countries.